I got my first pair of Havaianas when I participated in the Make Your Own Havaianas Event 2008 at the North Park, SM City Cebu in September last year. It was so much fun because I was the one who chose the embellishments for my flip flops. For P1,700, I got a cool, personalized pair of Havaianas complete with Swarovski crystals, pins and lacinhos. This Havaianas event is held annually and just the other day, Havaianas sent me the details for their 2009 Make Your Own Havaianas Event which is slated on May 28 to June 1, 2009 at Rockwell Tent, Makati City. I'm still undecided if I'll go or not, but just in case, see you there! Havaianas, Filipinos' favorite flip flops, has an exciting promo in time for Mother's Day. 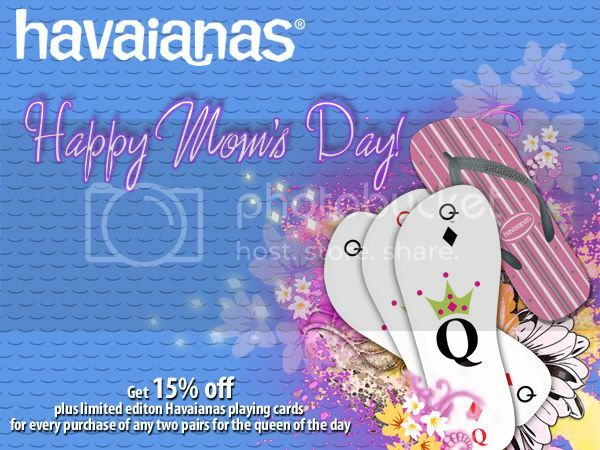 Treat your mom to a pair of Havaianas flip flops and avail of the 15 percent off and a set of limited edition Havaianas playing cards. Mother's Day cannot be cooler than that. Promo runs from May 8 to 10, 2009 only at selected Havaianas authorized retailers. For more information, visit your nearest Havaianas store.